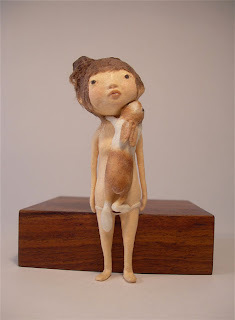 "Kyoko Okubo's small, gentle figures are meticulous crafted from washi, the traditional paper of Japan. 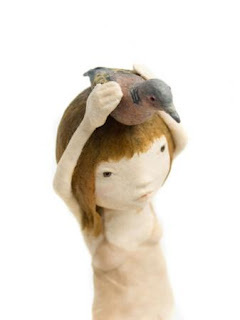 Her diminutive, symbolic self-portraits resonate with intensity and challenge the imagination." Love this! It's a bit wistful, a bit melancholic. Very touching. 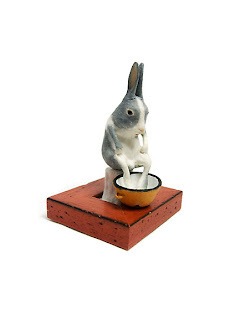 I love that bunny who's soaking his feet in the pot. Such a thoughtful face! 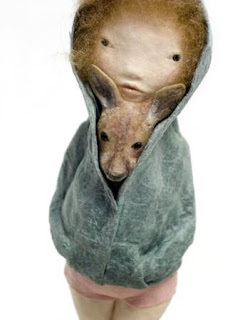 reminds me of western primitive papier mache dolls, with a Japanese twist that is! Love her style! very very unique and beautiful!